This is the story of my experience mediating my brain tumor online. It’s not often that an academic blog would feature a personal tale of harrowing illness or trauma, yet, if we, as an audience of this blog, took a close look at the issues at the heart of the mediations we examine each week, we would discover that though they are framed towards broad issues, the content, the interactions, and the expressions are all part of deeply personal experiences that enter into conversation with one another online. Take for example Kristin Peterson’s recent post on the tragic shooting of three young Muslim people in North Carolina. The personal responses to this tragedy she discusses are part of a complex web of interaction online. It is through these interactions in social media spaces that ideas and musings gain meanings that are often times much larger than just the ideas and hopes of the individual user who posted them. These posts now become a complex interaction between users; audiences and creators are fused, creating meanings and pushing ideas, interpreting our narratives through the collective jargon of online interaction. Online spaces are not without their problems. A student I taught just last semester in a senior level media course surveyed her friends for her final project and reported that social media often made them feel lonely, isolated or spiteful of the people who portrayed their curated lives as perfect. That being said, there are also the claims of Twitter revolutions and stories of the way social media enables people to say things they wouldn’t otherwise say, and experience things they wouldn’t otherwise experience. This post, while not oblivious to the dangers and pitfalls of our increasingly wired world, attends more to the latter view of social media as a space for potential. It is in a way an auto-ethnography of the way social media and new media enabled me, in part, to process a very difficult health challenge. Coming into what would be my third of five brain surgeries, I was no stranger to the way the Internet could serve as a forum through which to gain support and also figure out how to respond to and manage what was happening to me in my own mind. I posted everyday on Instagram, Facebook, Twitter, WordPress or all four. I posted funny things, sad things, sincere things, all kinds of things. Perhaps I should pause here to explain: Herbert is my brain tumor, I am Samira and Phoenix, Arizona was where I went for brain surgery. Then there’s that other hashtag in the image #btsm. It stands for Brain Tumor Social Media and after a few months of blogging (livingwithherbert.com) about my condition and tweeting my blog, I discovered that this is where the community came to discuss. This was our forum. It is a small fraction of what happens on Twitter, but it is our little space, and it’s a sacred space for those of us who’ve battled brain illness. Brain Tumor Warriors is what we’re called and the Internet is where we explain our battle to one another and ourselves. Our bodies are where we fight the battles. 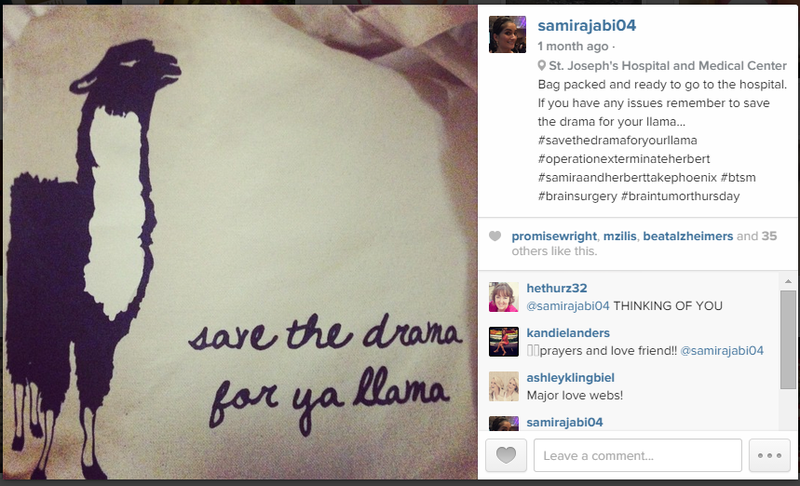 And then there’s that last hashtag, I was attempting to make a joke, a self-reflexive commentary through hashtag of how my brain surgery, while so huge to me, was so small in the scope of the Internet. I’m no Kanye West, I knew very few people would pay attention to what happened to me. Then, something interesting happened. 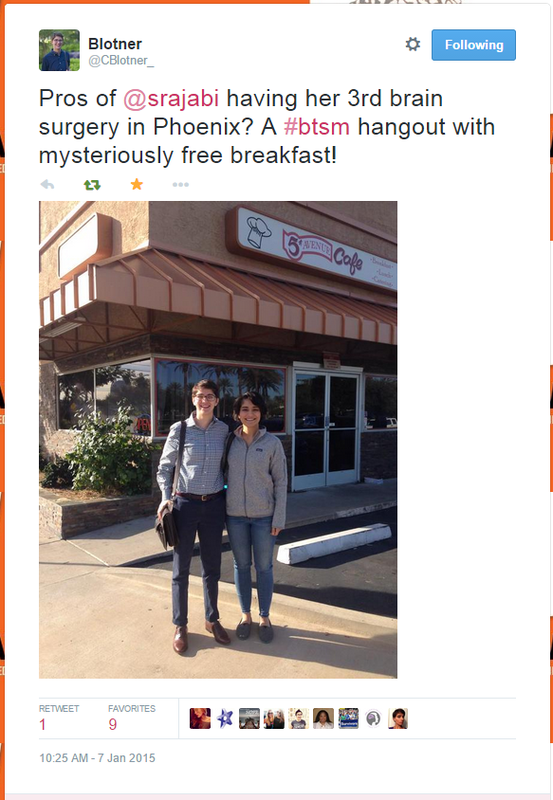 In the days before my surgery a Twitter user and #btsm contributor who goes by the handle @TheLizArmy pointed out that one of the main contributors and creators of the #btsm group lived near Phoenix. She tweeted us both to meet up. Next thing I knew, a person I had previously only known as @Cblotner_ was my friend, a real life, in the flesh, see them in real life friend, and we were having breakfast. It was as though we’d known each other for a lifetime. We didn’t know each other’s professions, nor did we know much detail about each other’s personal lives. What we knew was condition, struggle, challenge, healing and health. We knew shared experience and we knew that in our tweets and blog posts we had helped one another, and a handful of others cope. While @Cblotner_ and I sat by having breakfast, the community online was busily rallying around me and others. “We’re in this together,” the tweet had said. Generally when someone expressed that sentiment to me that had really no idea what was happening to me or why I was in the hospital, I forced a smile and retreated back to whatever distraction I had chosen for that moment. When the #btsm group let me know we were all in it together, I knew we were. They’d been there, at least somewhere that could approximate where I was at, and while we each dealt differently, it was like a private club that only we knew about, even though everyone on the Internet could see us if they wanted to. When I woke up from surgery I got on my phone once all the hugs had been handed out and the drugs administered. I got on Twitter to look at the alerts that covered the front of my screen. I started to click through and saw that every update @CBlotner_ received was sent out to the #btsm community, and the community had responded. 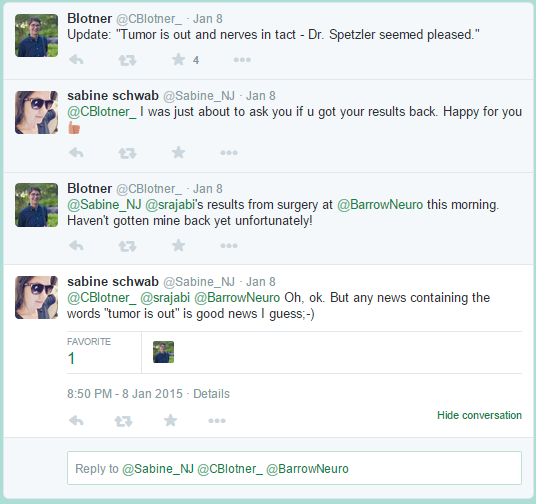 My brain surgery was being live tweeted. I was overcome. This community that had taken me in years ago without question saw me as much a part of them as I saw myself a part of the group. It was humbling, it was emotional, it was intimate and it was real. I felt chills go up my spine as I saw notifications of retweets, emoji icons of hands in prayer, and favorites. As I began to join the conversation again, having rejoined the world of the conscious, I continued to receive notifications of solidarity through favorites and retweets. There are, of course, websites built for this type of interaction. The website http://www.caringbridge.org/ for example allows families and those battling illness to curate a social media like page to enable “hope and healing.” It is meant to update family members and like a comment board on an article they can leave comments about what you’ve been through, they can even donate money. I have used this site and found it helpful, but it was different from what I saw happen on Twitter, Facebook, Instagram and WordPress. Through these sites people interacted with my story and weaved their own stories into mine. It wasn’t just about my survival, it was about how the collective would carry me through to survival. Caring Bridge, while an enormously helpful tool leaves those who are unwell, and their families to ask for support, #btsm showed up with support, even when I didn’t realize how much I needed it. My handful of retweets may not seem much when compared to celebrities who receive thousands of likes for their indulgent photos of themselves in the perfect light with the perfect filter, but to me, it was a meaningful exchange that could not have existed in most places. The space I inhabit on Twitter, in my blog, on Facebook, and Instagram, where users interact with me and weave our narratives together is a unique space. It creates an environment where it is “as-if” we can be anything and inhabit one another’s lives. The space suddenly becomes sacred, it is a space of compassion and of help. There are unspoken rules of behavior too, people rarely debate, disagreements are polite and civil and when support is needed it is given unequivocally and without allegiance to any one belief system. The only other time I’ve felt all other particularities of identity fall away and enable such communication was the targeted support group for my brain tumor. These spaces where we interact with one another foster a ritual practice where solidarity, group dynamics and everyone’s well being become paramount to my individual story or yours. Each of our narratives forms the backbone of the group. Each story matters, but together, they have their power. Carolyn Guertin, in her book Digital Prohibition notes that authorship online can function as a site of resistance and renegotiation, she notes that new media works are “fluid, deterritorialized systems.”. The community I found online from my illness, in many ways is disparate, we have nothing in common except that something, at some point, went wrong inside our skulls. Some of us float in and out of the community as our needs for support and fellowship become more or less pressing. Some of us lurk, not posting much. Some of us comment on everything. Some of us just like and retweet. Whatever each user’s role in the community, when put altogether it forms a constantly changing identity of a group, one which is always negotiating and renegotiating the rules for participation, but always fostering the production of meaning. The #btsm community is renegotiating what it means to be sick, what it means to be well, and what it means to be friends. A recent New York Times article entitled “How to Be a Friend in Deed” about how to be a friend in times of crisis noted that social media is a particularly precarious way through which to help a friend. One author, Megan Daum, thought people only reached out on social media to show how benevolent they were, “I see a lot of people saying things mostly for the sake of showing other people that they ‘know’ such-and-such person,” she said. The author of the piece, Bruce Feiler, later noted that “while technology does offer support, many still crave the real thing. Crisis is a test of friendship, and success, in this case, is measured in intimacy.” I find fault in the notion that intimacy is only found in the physical presence of others. Who is to say that the interactions of myself and my audiences online were not intimate. My blogs, my posts, and my challenges were deeply personal. I put them into a space that straddles the intersection of public and private, in order to enable them to morph. It is in that metamorphosis, and the ritual act of posting, I was able to mediate what happened to me, and find meaning in it. Not all of my coping happened online, I was also surrounded, in my physical realm by many people who loved me and came with flowers, gifts, hugs and more. That being said, the community online, the likes, the retweets, the shares, the comments, they gave me hope. They enabled me to make sense of what was happening to me, and from the comments, it seems they enabled other people to make sense of the various things happening to them, even if they’d never had brain surgery. The community was so powerful that when brain surgery number five rolled around I found myself needing the fellowship, the solidarity. I set out on Facebook, Instagram and Twitter asking for support and hope. In my time of need I asked my family for help and support, only my closest friends, and my online community. It wasn’t hard for people to click like or leave a quick note of hope and promise. There are few spaces where loving someone can be so simple, so easy. It is the third space enabled by these constructed worlds that allows us to freely negotiate our emotions in front of others. It is the suspension between public and private that allows us to be so fearlessly honest, so raw in the face of trauma. 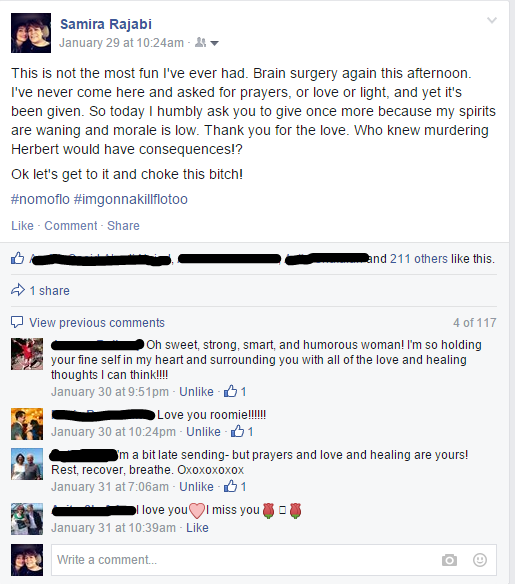 By the end of the day of my fifth brain surgery my post asking for prayer had over 200 likes, so when I went into the ICU, I wasn’t alone, I was backed up by my family, friends, and 200 of my favorite online connections. 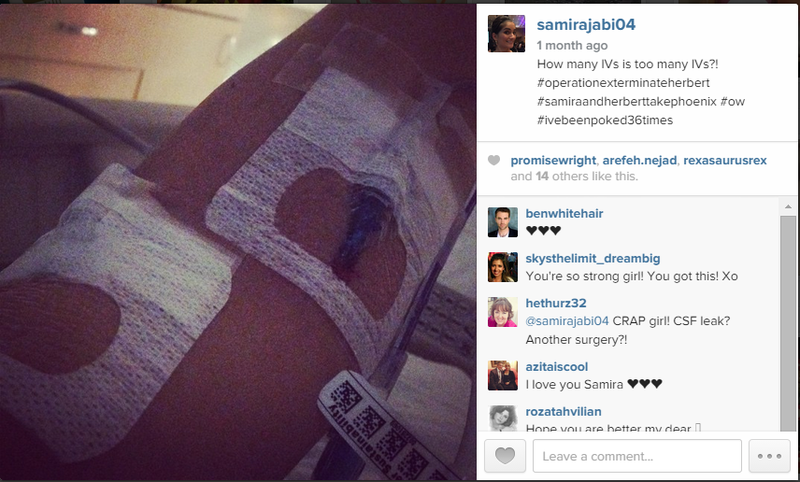 It’s a beautiful and powerful post, Samira. Thanks for sharing and showing us the power of social media in your struggle to cope with your illness.